Redwood National Park is one of those unique places a budget traveler would visit even if it was an expensive trip. (But it's not.) The trees in this park are thought to be the tallest on Earth, growing to heights of 250 to 350 feet tall. The average age of these giants is about five centuries, but a few could be up to 2,000 years old. It's possible to experience the grandeur of this place without so much as paying an admission charge. If you plan carefully, you can save money in other ways. Much of your expense will involve getting here. Plan ahead to get started on a path to one of the most unique and majestic travel destinations on Earth. 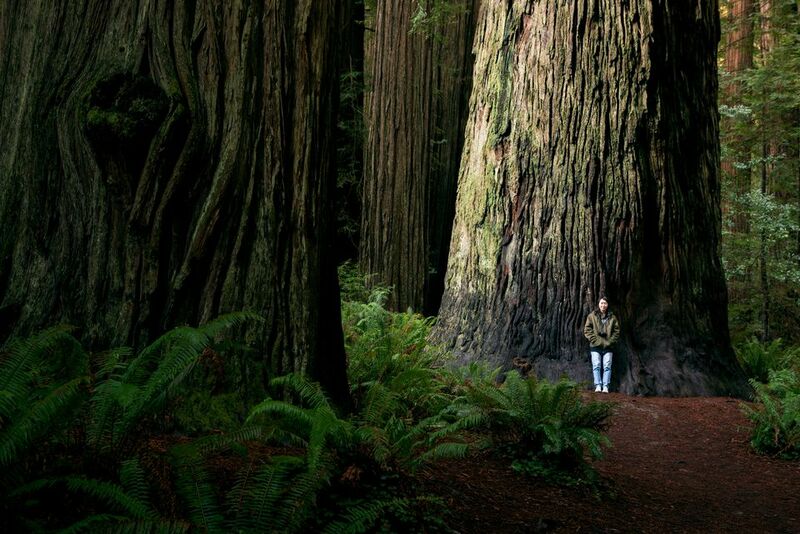 Redwood National Park, along about 40 miles of the Northern California coast, is not close to any major airports. Flying into San Francisco or Oakland means a drive of about 350 miles to the park. The airport in Portland, Oregon, is a similar distance away at 362 miles. So you'll need to build in nearly a day's drive each way between the park and any airport you choose. You can often save serious bucks on budget airlines. Check Frontier, Southwest, and Spirit if you're flying into San Francisco; Frontier and Southwest for Portland; and Southwest for Oakland. Redwood National Park is actually a series of smaller parks along a rugged portion of the Pacific Coast. The largest city in the area is Eureka, which is south of most of the parks. A quick hotel search for Eureka shows a number of budget chain offerings that include Best Western, Rodeway Inn, Days Inn, Travelodge, Motel 6, and Holiday Inn Express. Bed-and-breakfast options in the area are also affordable but start at a bit more per night than the budget options. There are four developed campgrounds in the Redwood National Park area, three of which are in the forest and one along the coast: Jedediah Smith, Mill Creek, Elk Prairie and Gold Bluffs Beach. Although camping here is a great experience, you'll pay for the privilege, with fees running $35 a night per vehicle as of the 2018 season. There are no day-use-only fees anywhere in the park except for the Gold Bluffs Beach section of Prairie Creek Redwoods State Park, which charges and $8 entrance fee. The parks are operated through the state park system. Although each of these campgrounds is operated on a first-come, first served basis, reservations are taken at all but Gold Bluffs Beach. It is strongly recommended that you make reservations during peak season, which is from May 27 to Sept. 4. Make your reservation at least 48 hours in advance. Backcountry camping is a popular and rewarding way to see the area, but it does require some arrangements in advance. A permit is required to use any of the eight backcountry sites, but it is free. You'll be expected to leave every site the way you found it (or better). Pay attention to park warnings that might change your backcountry plans. Rock slides or fires can cut off roads and trails you would need to use to access this type of site. Unlike many national parks, Redwood National Park does not offer any lodges within the park. The nearest hotels are off the park property in Crescent City, Eureka, Klamath, and Orick. Hiking in the park is a major attraction, but you'll also be able to take some excellent scenic drives, and both hiking and driving through the park are free. Some roads take you through spectacular coastal scenery, while other narrow paths lead through ancient forests. Some of these roads are unpaved and unsuitable for larger vehicles, so ask for advice before you start out in an SUV. Ranger walks at Redwood National Park include campfire talks and exploration of tidal pools. These are hosted at the developed campgrounds. There also are free kayak tours designed to show off the geology of the area. Although the program is offered at no charge, rangers do accept gratuities that are used to replenish equipment and train guides. Unless you're an avid hiker willing to trek many miles a day, Redwood National Park best lends itself to exploration by car. For those who can't make it here, Muir Woods near San Francisco is an alternative that is much closer to urban transportation hubs. Redwood National Park headquarters is on the northern end in Crescent City.